The fee to reserve the People's Pavilion for a private event is $100 per day with a $50 deposit. The Pavilion can be used at any time unless reserved for a special occasion. When reserved for a special function, approval for its use must be made through City Hall at (903) 569-6183. 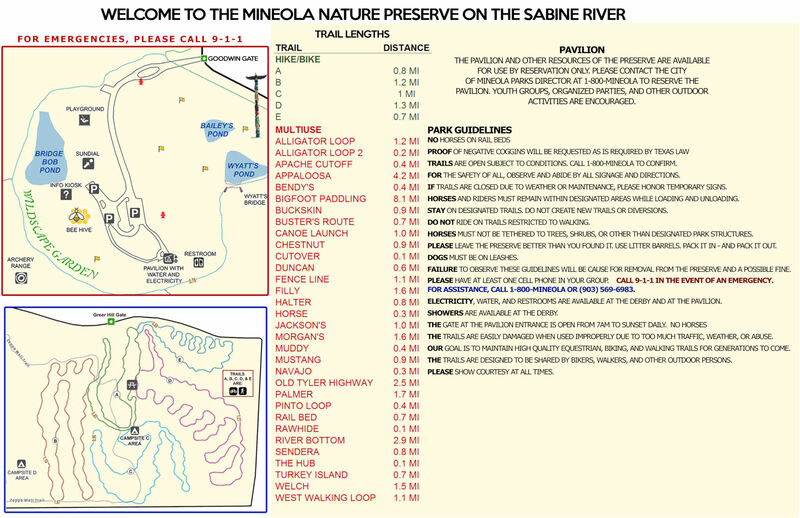 There will be a $ 50 .00 deposit required to reserve the Nature Preserve “People Pavilion ” for a special function. Your deposit will be refunded provided the rules and guidelines are followed and the “People's Pavilion” is left clean. 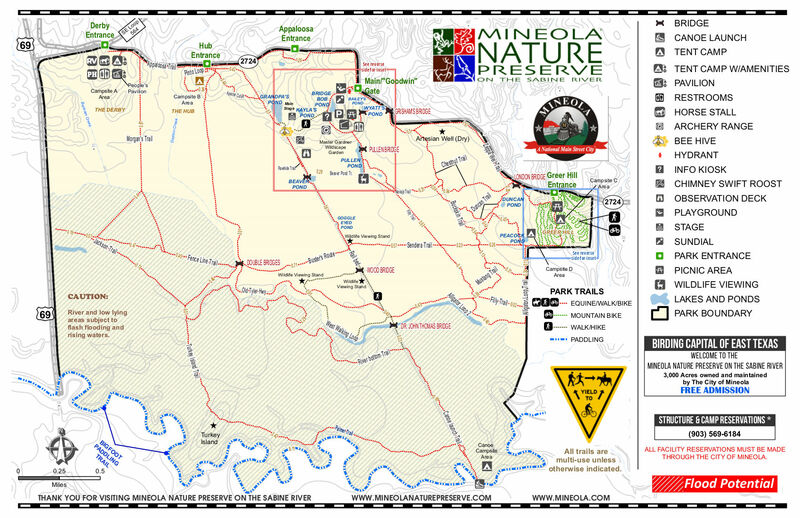 If you are paying by check make out 2 separate checks to the Mineola Nature Preserve - one for $100 and one for $50. Mail to: P. O. Box 179 Mineola, TX 75773. You may pick up your deposit check at City Hall after your event or, given your permission, we will shred it. ANY and ALL trash should be bagged and picked up in and around the “People's Pavilion” area including the restrooms and placed in dumpster. You must provide your own cleaning supplies (ie:broom/dust pan & trash bags). At no time should nails or screws be used on any location of the “People's Pavilion”. PLEASE DO NOT hang signs or drapery by using tape, nails, screws, thumbtacks or staples. Any decorations should be hung with cord or twine. Please REMOVE all decorations as soon as your event has ended. The “People's Pavilion” is not a play area. Children under 12 years of age must be accompanied by an adult. NO BICYCLES, ROLLERBLADES OR SKATEBOARDS WILL BE PERMITTED IN THE PAVILION. NO LOUD MUSIC except with approval from the City (903-569-6183) and during special events.